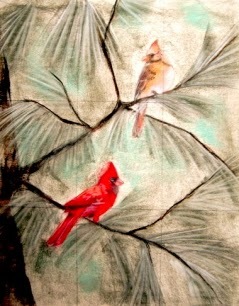 The Cardinal and His Lady began as an 18 x 24 inch pastel sketch on newsprint. The original plan was to have the female bird on the upper branch and the male on the lower. After some consideration I decided the brightness of his plumage would better serve the composition if I put the male on the upper branch and his 'lady' on the lower branch. The finished work is a 16 x 20 inch pastel on Sennelier la carte sanded pastel paper. 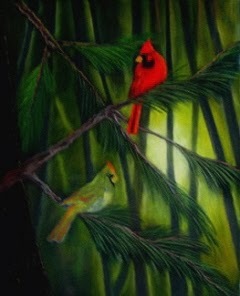 I used Mungyo Gallery semi hard pastels in combination with various soft pastels and Conte a Paris pastel pencils. The finished work is in the private collection of Manon Baillargeon of Quebec.